progeny seedsfc8' 3/4 of F2 seeds were round and 1/4 were wrinkled, a 3:1 ratio. 3.3 Mendel conducted monohybrid crosses. The offspring from the parents in the P generation are the F1 (first filial) generation. When Mendel examined the F1 of this cross, he found that they expressed only one of the phenotypes present in the parental generation: all the F1 seeds were round. Mendel carried out 60 such crosses and always obtained this result. He also conducted reciprocal crosses: in one cross, pollen (the male gamete) was taken from a plant with round seeds and, in its reciprocal cross, pollen was taken from a plant with wrinkled seeds. Reciprocal crosses gave the same result: all the F1 were round. Mendel wasn't content with examining only the seeds arising from these monohybrid crosses. The following spring, he planted the F1 seeds, cultivated the plants that germinated from them, and allowed the plants to self-fertilize, producing a second generation (the F2 generation). Both of the traits from the P generation emerged in the F2; Mendel counted 5474 round seeds and 1850 wrinkled seeds in the F2 (see Figure 3.3). He noticed that the number of the round and wrinkled seeds constituted approximately a 3 to 1 ratio; that is, about 3/4 of the F2 seeds were round and 1/4 were wrinkled. Mendel conducted monohybrid crosses for all seven of the characteristics that he studied in pea plants, and in all of the crosses he obtained the same result: all of the F1 resembled only one of the two parents, but both parental traits emerged in the F2 in approximately a 3:1 ratio. Mendel drew several important conclusions from the results of his monohybrid crosses. First, he reasoned that, although the F1 plants display the phenotype of only one parent, they must inherit genetic factors from both parents because they transmit both phenotypes to the F2 generation. The presence of both round and wrinkled seeds in the F2 could be explained only if the F1 plants possessed both round and wrinkled genetic factors that they had inherited from the P generation. He concluded that each plant must therefore possess two genetic factors coding for a character. The genetic factors that Mendel discovered (alleles) are, by convention, designated with letters; the allele for round seeds is usually represented by R, and the allele for wrinkled seeds by r. The plants in the P generation of Mendel's cross possessed two identical alleles: RR in the round-seeded parent and rr in the wrinkled-seeded parent (< Figure 3.4a). Should Genetics Researchers Probe Abraham Lincoln's Genes? Many people agree that no one should be forced to have a genetic test without his or her consent, yet for obvious reasons this ethical principle is difficult to follow when dealing with those who are deceased. There are all sorts of reasons why genetic testing on certain deceased persons might prove important, but one of the primary reasons is for purposes of identification. In anthropology, genetic analysis might help tell us whether we have found the body of a Romanov, Hitler, or Mengele. In cases of war or terrorist attacks, such as those on September 11, 2001, there might be no other way to determine the identify of a deceased person except by matching tissue samples with previously stored biological tissue or with samples from close relatives. One historically interesting case, which highlights the ethical issues faced when determining genetic facts about the dead, is that which centers on Abraham Lincoln. Medical geneticists and advocates for patients with Marfan syndrome have long wondered whether President Lincoln had this particular genetic disease. After all, Lincoln had the tall gangly build often associated with Marfan's syndrome, which affects the connective tissues and cartilage of the body. Biographers and students of this man, whom many consider to be our greatest president, would like to know whether the depression that Lincoln suffered throughout his life might have been linked to the painful, arthritis-like symptoms of Marfan syndrome. Lincoln was assassinated on April 14, 1865, and died early the next morning. An autopsy was performed, and samples of his hair, bone, and blood were preserved and stored at the National Museum of Health and Medicine; they are still there. 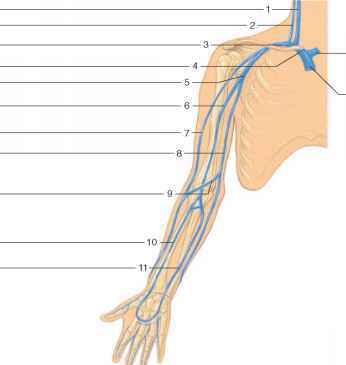 The presence of a recently found genetic marker indicates whether someone has Marfan syndrome. With this advancement, it would be possible to use some of the stored remains of Abe Lincoln to see if he had this condition. However, would it be ethical to perform this test? We must be careful about genetic testing, because often too much weight is assigned to the results of such tests. There is a temptation to see DNA as the essence, the blueprint, of a person—that the factor that forms who we are and what we do. Given this tendency, should society be cautious about letting people explore the genes of the deceased? And, if we should not test without permission, then how can we obtain permission in cases where the person in question is dead? In Honest Abe's case, the "patient" is deceased and has no immediate survivors; there is no one to consent. But allowing testing without consent sets a dangerous precedent. It may seem a bit strange to apply the notions of privacy and consent to the deceased. But, considering that most people today agree that consent should be obtained before these tests are administered, do researchers have the right to pry into Lincoln's DNA simply because neither he nor his descendants are around to say that they can't? Are we to say that anyone's body is open to examination whenever a genetic test becomes available that might tell us an interesting fact about that person's biological makeup? Many prominent people from the past have taken special precautions to restrict access to their diaries, papers and letters; for instance, Sigmund Freud locked away his personal papers for 100 years. Will future Lincolns and Freuds need to embargo their mortal remains for eternity to prevent unwanted genetic snooping by subsequent generations? And, when it comes right down to it, what is the point of establishing whether Lincoln had Marfan syndrome? After all, we don't need to inspect his genes to determine whether he was presidential timber—Marfan or no Marfan, he obviously was. The real questions to ask are, Do we adequately understand what he did as president and what he believed? How did his actions shape our country, and what can we learn from them that will benefit us today? In the end, the genetic basis for Lincoln's behavior and leadership might be seen as having no relevance. Some would say that genetic testing might divert our attention from Lincoln's work, writings, thoughts, and deeds and, instead, require that we see him as a jumble of DNA output. Perhaps it makes more sense to encourage efforts to understand and appreciate Lincoln's legacy through his actions rather than through reconstituting and analyzing his DNA. two alleles coding for the character. for round seeds (RR) with a plant homozygous for wrinkled seeds (rr). ^ Each plant possessed! Mendel crossed a plant homozygous two alleles coding for the character. 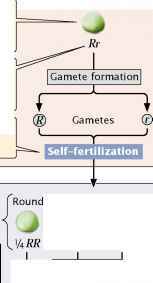 |3| The two alleles in each plant separated when gametes were formed one allele went into each gamete. 4| Because round is dominant over wrinkled, all the Ft had round seeds. 5 Gametes fused to produce heterozygous Ft plants that had round seeds. 71 .. .which appeared in a 3:1 ratio of round to wrinkled. Homozygous round peas produced plants with only round peas. These heterozygous plants produced round and wrinkled seeds in a 3:1 ratio. 4 3.4 Mendel's monohybrid crosses revealed the principle of segregation and the concept of dominance. Mendel called dominant, and those traits that disappeared in the F1 heterozygous offspring he called recessive. When dominant and recessive alleles are present together, the recessive allele is masked, or suppressed. The concept of dominance was a third important conclusion that Mendel derived from his monohybrid crosses. Mendel's fourth conclusion was that the two alleles of an individual plant separate with equal probability into the gametes. 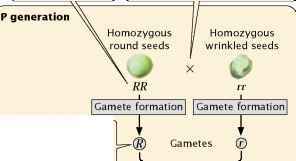 When plants of the F1 (with genotype Rr) produced gametes, half of the gametes received the R allele for round seeds and half received the r allele for wrinkled seeds. The gametes then paired randomly to produce the following genotypes in equal proportions among the F2: RR, Rr, rR, rr (Figure 3.4c). Because round (R) is dominant over wrinkled (r), there were three round progeny in the F2 (RR, Rr, rR) for every one wrinkled progeny (rr) in the F2. This 3:1 ratio of round to wrinkled progeny that Mendel observed in the F2 could occur only if the two alleles of a genotype separated into the gametes with equal probability. The conclusions that Mendel developed about inheritance from his monohybrid crosses have been further developed and formalized into the principle of segregation and the concept of dominance. The principle of segregation (Mendel's first law) states that each individual diploid organism possesses two alleles for any particular characteristic. These two alleles segregate (separate) when gametes are formed, and one allele goes into each gamete. Furthermore, the two alleles segregate into gametes in equal proportions. The concept of dominance states that, when two different alleles are present in a genotype, only the trait of the dominant allele is observed in the phenotype. Mendel confirmed these principles by allowing his F2 plants to self-fertilize and produce an F3 generation. He found that the F2 plants grown from the wrinkled seeds — those displaying the recessive trait (rr) — produced an F3 in which all plants produced wrinkled seeds. Because his wrinkled-seeded plants were homozygous for wrinkled alleles (rr) they could pass on only wrinkled alleles to their progeny ( Figure 3.4d). The F2 plants grown from round seeds — the dominant trait — fell into two types (Figure 3.4c). 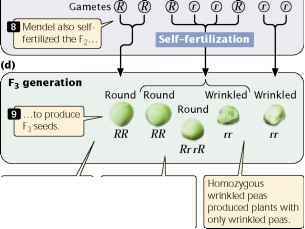 On self-fertilization, about 2/3 of the F2 plants produced both round and wrinkled seeds in the F3 generation. These F2 plants were heterozygous (Rr); so they produced 1/4 RR (round), 1/2 Rr (round), and 1/4 rr (wrinkled) seeds, giving a 3:1 ratio of round to wrinkled in the F3. About 1/3 of the F2 plants were of the second type; they produced only the dominant round-seeded trait in the F3. These F2 plants were homozygous for the round allele (RR) and thus could produce only round offspring in the F3 generation. Mendel planted the seeds obtained in the F3 and carried these plants through three more rounds of self-fertilization. In each generation, 2/3 of the round-seeded plants produced round and wrinkled offspring, whereas 1/3 produced only round offspring. These results are entirely consistent with the principle of segregation. The principle of segregation states that each individual organism possesses two alleles coding for a characteristic. These alleles segregate when gametes are formed, and one allele goes into each gamete. The concept of dominance states that, when dominant and recessive alleles are present together, only the trait of the dominant allele is observed. We have now seen how the results of monohybrid crosses are explained by Mendel's principle of segregation. Many students find that they enjoy working genetic crosses but are frustrated by the abstract nature of the symbols. Perhaps you feel the same at this point. You may be asking "What do these symbols really represent? What does the genotype RR mean in regard to the biology of the organism?" The answers to these questions lie in relating the abstract symbols of crosses to the structure and behavior of chromosomes, the repositories of genetic information (Chapter 2). In 1900, when Mendel's work was rediscovered and biologists began to apply his principles of heredity, the relation between genes and chromosomes was still unclear. The theory that genes are located on chromosomes (the chromosome theory of heredity) was developed in the early 1900s by Walter Sutton, then a graduate student at Columbia University. Through the careful study of meiosis in insects, Sutton documented the fact that each homologous pair of chromosomes consists of one maternal chromosome and one paternal chromosome. Showing that these pairs segregate independently into gametes in meio-sis, he concluded that this process is the biological basis for Mendel's principles of heredity. The German cytologist and embryologist Theodor Boveri came to similar conclusions at about the same time. Sutton knew that diploid cells have two sets of chromosomes. Each chromosome has a pairing partner, its homologous chromosome. One chromosome of each homologous pair is inherited from the mother and the other is inherited from the father. Similarly, diploid cells possess two alleles at each locus, and these alleles constitute the genotype for that locus. The principle of segregation indicates that one allele of the genotype is inherited from each parent. This similarity between the number of chromosomes and the number of alleles is not accidental — the two alleles of a genotype are located on homologous chromosomes. The symbols used in genetic crosses, such as R and r, are just shorthand notations for particular sequences of DNA in the chromosomes that code for particular phenotypes. The two alleles of a genotype are found on different but homologous chromosomes. During the S stage of meiotic interphase, each chromosome replicates, producing two copies of each allele, one on each chromatid (< Figure 3.5a). The homologous chromosomes segregate during anaphase I, thereby separating the two different alleles (Figure 3.5b and c). This chromosome segregation is the basis of the principle of segregation. During anaphase II of meiosis, the two chromatids of each replicated chromosome separate; so each gamete resulting from meiosis carries only a single allele at each locus, as Mendel's principle of segregation predicts. If crossing over has taken place during prophase I of meiosis, then the two chromatids of each replicated chromosome are no longer identical, and the segregation of different alleles takes place at anaphase I and anaphase II (see Figure 3.5c). Of course, Mendel didn't know anything about chromosomes; he formulated his principles of heredity entirely on the basis of the results of the crosses that he carried out. Nevertheless, we should not forget that these principles work because they are based on the behavior of actual chromosomes during meiosis. The chromosome theory of inheritance states that genes are located on chromosomes. The two alleles of a genotype segregate during anaphase I of meiosis, when homologous chromosomes separate. The alleles may also segregate during anaphase II of meiosis if crossing over has taken place. One of Mendel's goals in conducting his experiments on pea plants was to develop a way to predict the outcome of crosses between plants with different phenotypes. In this section, we will first learn a simple, shorthand method for predicting outcomes of genetic crosses (the Punnett square), and then we will learn how to use probability to predict the results of crosses. The Punnett square To illustrate the Punnett square, let's examine another cross that Mendel carried out. By crossing two varieties of peas that differed in height, Mendel established that tall (T) was dominant over short (t). He tested his theory concerning the inheritance of dominant traits by crossing an F1 tall plant that was heterozygous (Tt) with the short homozygous parental variety (tt). This type of cross, between an F1 genotype and either of the parental genotypes, is called a backcross. ffi The two alleles of genotype Rr are located on homologous chromosomes,. .which replicate during S phase of meiosis.